Geostorm is a textbook example of the ongoing infantilization of mainstream, commercial film making. It’s a multimillion-dollar FX driven movie, whose plot is staggeringly trite, and screenplay is utterly puerile. This bloated mess also sees several quality character actors (Andy Garcia and Ed Harris) slumming it and phoning in their performances. Furthermore, Geostorm is bookended by one of the crassest narrations I’ve heard in a mainstream film. Delivered by a child actor, it espouses the worst sort of naïve geo-politics of the “why can’t we all just get along?” variety. Until watching this film, I had previously considered the 2014 disaster movie, Into the Storm, to be the most contrived, ill-conceived and intellectually insulting example of contemporary Hollywood film making. However, Geostorm takes stupidity to an entirely new level. It is morbidly fascinating to watch as it lumbers along its two-hour running time, but sadly morbid fascination is not the same as entertaining. It’s not often that I pick up my notebook to write down film dialogue. On the occasions that I do, it’s usually because I’m impressed with the credibility of an onscreen exchange or feel that the screenwriter(s) has created something profound. In this instance, it was due to something being so utterly insane, that I had to double check that I’d heard it correctly. In Geostorm, due to extreme weather brought about by climate change, “the world came to together and fought back”. If you are curious as to how one actually fights back against “the weather” you counteract the basic causes; heat, pressure and water. This done by firing micro-missiles, using lasers and microwaves. Yes, that’s right you blow weather up. Now, it not uncommon for Hollywood to indulge in what is currently known as “Science Woo” and it has often formed the basis for entertaining movies. However, cinema per se is predicated on the principle of “suspension of disbelief”. If audiences are willing to do that that then you can embark upon the most far-fetched of narratives. However, if viewers cannot do this or are jarred from such a state due to the plot, then it’s game over. Geostorm is rife with plot details and minor asides that will continuously baffle the attentive viewer. This is not uncommon in blockbuster, popcorn movies but it seems to happen every five minutes in this case. To highlight this, I shall list some of the notes that I made while viewing, as bullet points. All of which I would classify as WTF moments. A “red shirt” character (a whistle blower) hides from Spec Op team in closet while they conduct a “thorough” search. The aforementioned “red shirt” character is run over, sustaining facial injuries but his glasses remain on his head and unbroken. An action set piece has a bikini clad lady, fleeing the beach in Rio as an approaching storm front freezes everything in its path. She runs into an alley and a Boeing 747 drops on here. She survives with minor injuries. They have firearms in a pressurised space station. The Secretary of State has an RPG in the boot/trunk of his car. I could list many more examples but frankly the above is sufficient to verify the utter inanity of Geostorm. 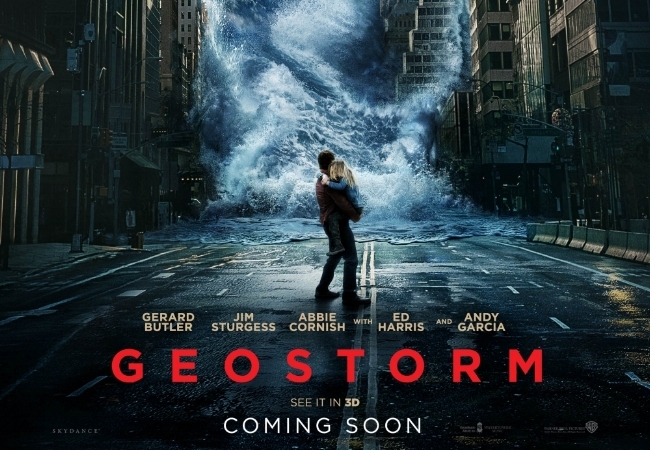 Now there is a risk in me critiquing Geostorm, in that presenting examples of its stupidity out of context and possibly presenting them in a humorous light, it may lead to some thinking that the film falls into that esoteric niche market group of “it’s so bad, it’s good”. As I have stated before in several previous reviews I don’t hold with this philosophy and frequently find that films labelled as such are not. They’re just excruciatingly bad and trying to watch. Bearing this in mind, Geostorm is a chore to sit through and insultingly stupid. Now it is worth mentioning that the movie had a troubled production and Producer turned Director Dean Devlin delivered a cut of the movie that was received poorly by test audiences. Hence Danny Cannon was brought on board to reshoot numerous scenes and attempt to fashion a more acceptable product. This in itself raises some interesting questions. If the final cut is this bad, how poor was Dean Devlin’s initial version? However, irrespective of this the fundamental problems with Geostorm is that its premise is just unbelievable. It’s a prime example of the commodification of entertainment and shows all the hallmarks of a film born of focus groups and market research. The infantilization of entertainment, especially cinema, is a big issue and not one I wish to tackle solely in this post. But Geostorm is exactly the sort of film this mindset spawns. And if you take a moment to reflect upon the dogma that drives such a way of thinking, it is utterly repellent and whole heartedly contemptuous of the very audience it seeks to cater too. Geostorm is stupid, loud, and vacuous because that’s what the producers think the public wants and more to the point, what they think the public are. Furthermore, the only practical way to stop Hollywood from churning out such stupid drivel, is for the public to shun such films. Financial failure is something that the film industry takes note of and will often kill a franchise or a trend dead in its tracks. So, it just remains to be seen as to whether or not the public lose their appetite for such films. I sincerely hope that it does, as an exclusive diet of material such as Geostorm is neither conducive to broadening audiences tastes or more to the point entertaining.